Everybody loves snapping shots in a photobooth. With this full service feature, the entire party ends up behind the curtain in portrait-quality photos that are projected for all to enjoy. Unlike a simple camera on a tripod, my Live Photobooth offers the opportunity for your guests to work with a real photographer, creating a much more dynamic experience and giving you much better photos. I will set up a seamless background and lights in a location of your designation. I take studio quality portraits of guests at their request throughout the entire event. 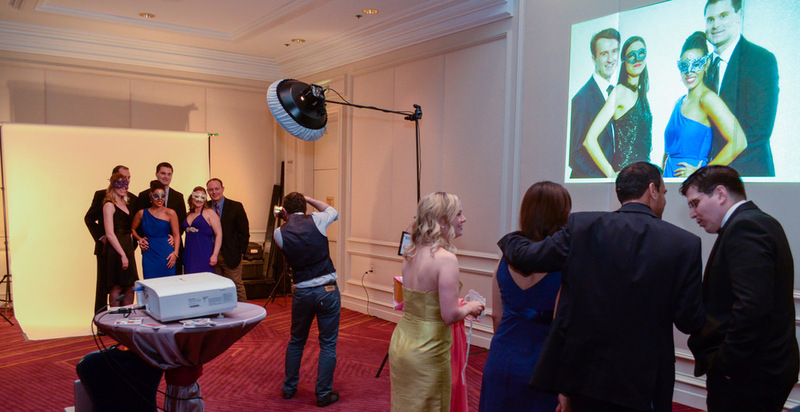 Photos are then periodically uploaded into a running random slideshow and projected on a wall or screen, providing (near) instant gratification for the attendees. After the event, I'll upload the photos to my website where they can be downloaded by guests - free of charge - the next day. Additional options include physical prints to be given away as a keepsake, various props and costumes for your guests and customized backgrounds. Entertainment abounds, whether you're watching the projected portraits of your cohorts, plotting your next group shot, or jumping in front of the camera yourself. This is a blast for wedding receptions, art gallery parties, corporate events, fundraisers, reunions, orientations, or any large party. I'll let the photos speak for themselves. Click here for a gallery of more photobooth images as well as past events.